FORT MYERS, Fla. -- At noon yesterday, at the minor league complex, at long last, David Wells made his spring debut, and three pitches in he had recorded two outs. ''He's where he needs to be," one major league scout said to another, in between pointing his radar gun at Wells, to show fastballs consistently at 88 miles per hour. 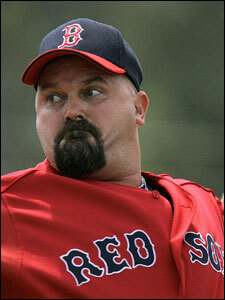 Said the other scout, in a ho-hum manner: ''He's David Wells." Indeed, the left arm attached to the 42-year-old body looked young and its motions easy as ever. Mechanically, Wells wasn't overly enthused by the 53 pitches he tossed over three innings, during which he allowed two runs on five hits with no walks and one whiff, on a paralyzing curveball. But, he said his right knee, subjected to a rather invasive arthroscopy this winter, felt ''great. So far so good." ''No question," he said, he will be healthy enough to pitch come the start of the regular season. However, the lingering question remains whether the Red Sox want Wells in the rotation that soon. The Sox have offdays April 6 and April 10, and Terry Francona is on record as saying ''I really am not comfortable having a five-man rotation with two days off." He's also said Curt Schilling, Tim Wakefield, and Josh Beckett are likely to pitch in that order. With Matt Clement healthy and sharp (he's allowed only two hits and no runs in four spring innings), Wells could be left without a turn until mid-April. The season begins April 3, but the Sox don't need a fifth starter until April 17. Wells said he has yet to hear that he might be skipped, but the possibility is logical, and something Francona has hinted at. ''I'd have a problem with that," Wells said after he pitched yesterday. ''I would. If they're going to go with four and I'm going to be the odd man out, that's not going to sit well with me. ''Right now it's too early to really speculate on that. If they still feel the same way after a few more outings, we're definitely going to have to sit down and talk. I don't see myself sitting until the 15th to wait to pitch. I just don't see it at all." Francona said, ''We came to camp respecting his wishes [to be traded]. Things change. And I'm happy they changed. At the same token, I'm not going to take the four pitchers I've talked to . . . "
He halted mid-sentence, changed direction, and said only, ''Sometimes you have to be a little flexible." Wells, informed of this, said if his earlier wish to be moved closer to a West Coast team will be held against him, ''They can grant that first wish." Why won't Wells just concede a start or two and allow his knee more time to heal? Could be that he's healthy and competitive and wants the ball. Could be that he's looking at his bonus clause ($200,000 per start for starts 11-20 and $300,000 per for starts 21-30). Asked which reason would make him more resistant to skipping a turn or two, he cut off the question. ''I wouldn't do it," he said. ''I just wouldn't do it. I don't see the reason. We'll cross that path." Wells did defend Clement's spot in the rotation. ''I don't see why Clement should sit out," said Wells, who hopes to pitch in an actual spring game early next week. ''Matt's having a hell of a spring and he's throwing the ball well. To me, you've got Beckett, you've got Wake, and you've got Schilling. They've got five guys out there who are veteran guys that can pitch, that can help a team out. I think that's what they should do. If they don't, it's their decision and we'll see what happens." Wells also revealed that he jokingly lobbied Francona to start Beckett ahead of Schilling Opening Day at Texas. ''I said, 'Why doesn't the young guy come in and start? Why's it gotta be Curt?' " Wells said. ''He goes, 'Well, I've known him longer.' I said, 'Oh, we've got to play that game, huh? The I've-known-you-longer game.' We were just joking around." In the meantime, Wells said he's concerning himself with demonstrating that he's healthy. ''I've got to go out there and pitch and build up," said Wells, who pitched only 17 innings last spring and said he needs only 15-20 this spring. ''Today I felt great and the knee didn't bother me and that's their main concern. If they're going to hold me back because they think my knee [is a problem], I can only tell them how I feel. ''I've done what they've asked me to do. I'm there every morning, getting my work in, working on my knee. It's just a matter of proving to them. Today I think that's a pretty good sign, three innings right out of the chute and not feeling anything. If I felt something, I would tell them. ''In this business, all of a sudden they're all scholars and scientists. They know everything. They don't know how I feel. If I wasn't that sharp [they might assume], 'Well, his knee's still bothering him.' Well, my knee's not bothering me." It didn't look like it was yesterday, but it was a brief sample to make that kind of determination. Still, Wells moved to field some bunt attempts and snared a comebacker. He located fairly well (34 of his 53 pitches were strikes). He threw a couple cutters with ideal late break, including one to his last hitter of the day. The ball bore in on the hands of the hitter, who took a half swing, sundering his bat. ''Put that one between his hands," joked one of the scouts. ''If he didn't swing," Wells later said, ''it woulda hit him in the face." Despite all of Wells's talk this spring, good and bad, Francona said yesterday morning, ''With Boomer, when things go a little haywire, you can reel it back in pretty quick. He may say something before he's ready to think it through. We know that. That happens. It may give you a headache. [But] he's got a pretty good heart. He knows what's going on." There is, it seems, one scenario that could have Wells pitching during the Sox' opening series at Texas. That is, for Texas. One of the scouts behind home plate works for the Rangers, who need pitching help. Likely? Not necessarily. Possible? Sure.